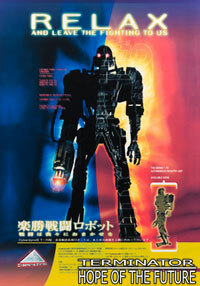 These are the Cyberdyne Product Posters of Universal Studios Japan's Terminator 2 3D. 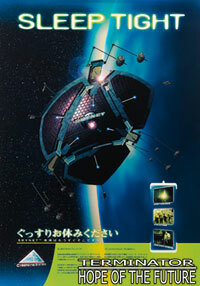 Thanks to Kevin Leahy for translating the Japanese text into English. You can say what you like about peace, but when it comes times for war, it's human nature to want to win. But no one wants to risk all that danger, right? That's why there's the model T-70 combat robot to do the fighting for you. Our company's latest development in combat robots, they're loaded with features like gattling guns, motion tracking, lasers, and more. So bring it on! It's the fully automated home doctor Probe 2000™! Medical costs just keep going up, don't they? Doctors gouge on prices, and the sky is the limit for medical insurance rates these days. It may look like trouble, but it's not. 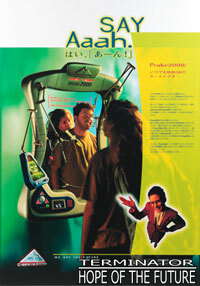 Now you can leave it to our Probe 2000. Our fully automated doctor system can see to your needs 24 hours a day. Simple daily test can diagnose and specifically treat up to 410 different ailments. Of course, you can rest assured that it comes stocked with a wide variety of medications. Probe 2000 is widely respected, and most health insurance companies trust its diagnoses. Now you, too, can live every day in safety and security. If you've got little kids around the house, you can't let you guard down for a second. Taking your eye off them for a second and they're running all over the place. Child-rearing can be a real pain. And that's why there's the KidCollar™! It's easy to use--simply wrap it around your child's neck. When your child nears a door or window, the sensors deliver a mild electric shock to their neck. So sit back, relax, and leave your child to us. What do you want to be when you grow up? A doctor, a politician, or a lawyer? A singing idol? Well, that's pretty snooty of you! It takes more than just those to keep the world spinning. 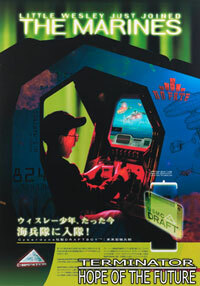 And in response to the dwindling number of young people interested in entering the military, we have created DraftBoy™! It's a revolutionary new recruitment system to discover hot talent imbued with superior combat skills at an early age. Capable of being incorporated in machines in video arcades, it can evaluate 30 different facets of the player (perception, reflexes, tactics, coolness under fire, etc.) during play. It's configured to forward the personal information on skilled personel to the Pentagon. Your house is just filled with stuff, stuff, and more stuff. And each and every thing you use has different power needs. And the costs of heat and light are through the roof. 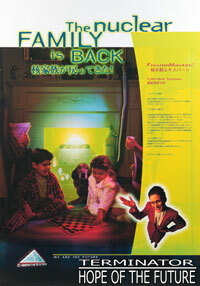 That's when you need our company's home reactor, FissionMaster™! Its fuel is easy-to-use plutonium. We realize it's radioactive, but there's no need to worry. It's completely safe. Skynet™ is the greatest project in the history of the human race. The most powerful defense system, developed thanks to Dr. Dyson's research into a network wired like the human nervous system, or NeuralNet. Watching and monitoring the whole world. And controlling America's entire arsenal of nuclear weapons. Independant of human judgement, and capable of reacting with incredibly precision. It also monitors all the computer and telephone lines on earth. From now on, you life is going to be made much easier! With Skynet controlling everything, peace is assured.